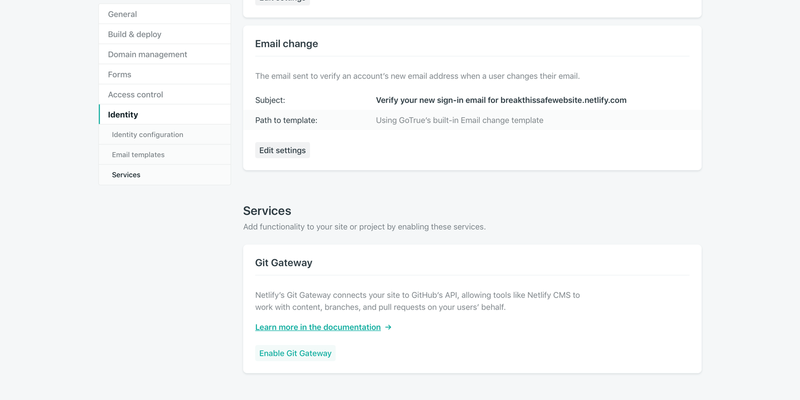 Netlify’s Git Gateway connects your site to Git provider’s API, allowing tools like Netlify CMS to work with content, branches, and pull requests on your users’ behalf. After clicking the Deploy to Netlify button above, you can follow the steps below to invite a user to the project. When that user clicks the link in the invitation email that follows, they’ll have access to edit site content with Netlify CMS, without a GitHub/GitLab account or access to the repository. That’s one example of something awesome that you can do with Git Gateway. To add Git Gateway to your existing web projects, check out the instructions below. Note: Git Gateway requires HTTPS. If you’re using a custom domain, be sure to enable HTTPS before enabling Git Gateway on your site. To get started using Git Gateway on a site, first enable Identity service, then go to Settings > Identity > Services > Git Gateway, and click Enable Git Gateway. This will automatically provision your site so that Identity users have access to Git Gateway’s selected endpoints on your site’s connected GitHub/GitLab repository. Repository: Not editable. Indicates which repository the Gateway will access (the site’s connected repository). Works with GitHub or GitLab repositories only. Roles: Naming one or more roles in this field will limit Gateway access to Identity users assigned a matching role (in individual Identity user data). Leaving this field blank will give access to all Identity users on the site. GitHub/GitLab API access token: Click the link to generate a token, or you may supply your own Personal Access Token. Be sure the token is generated for a user with sufficient permission on your linked repository to perform the actions you want to pass through the Gateway. Go to Settings > Build & deploy > Continuous Deployment > Build settings to re-link the repository. Go to Settings > Identity > Services > Git Gateway to add a new API access token following the instructions in the section above. Note that GitLab’s namespaced path encoding rule requires a url-encoded %2F between the user and repository names. Contact us if you have a use case that requires broader access.